726 pages | 125 B/W Illus. 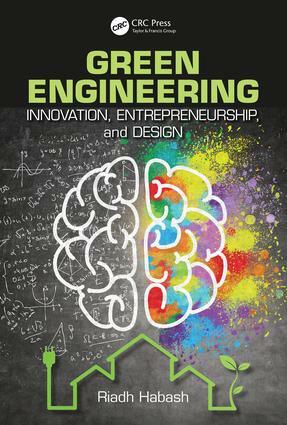 "Green Engineering: Innovation, Entrepreneurship and Design is very useful for engineering educators, managers, manufacturers, developers and industry professionals. It contains various design problems, research exercises and various other topics for discussion. This book assists students, faculty, and engineers in understanding the scientific principles underlying sustainable green design." Introduction.The Sustainability Landscape.Technology and Sustainability. Engineering and Society: Policy and Ethics. Creativity Invention and Innovation. Engineering Leadership. Engineering Entrepreneurship. The Design Landscape. Introduction to Engineering Design. Engineering Design Process. Sustainability and Green Design. Professor Riadh W.Y.Habash holds the McLaughlin Research Chair at the University of Ottawa (Canada). Since 2002, he has established a substantial research and teaching record in various areas, along with publishing four books, four book chapters, two proceedings, and more than 80 journal and conference papers. He has also conducted 60 invited courses and workshops. His research interests involve engineering education, renewable energy, mechatronics and biomedical engineering.